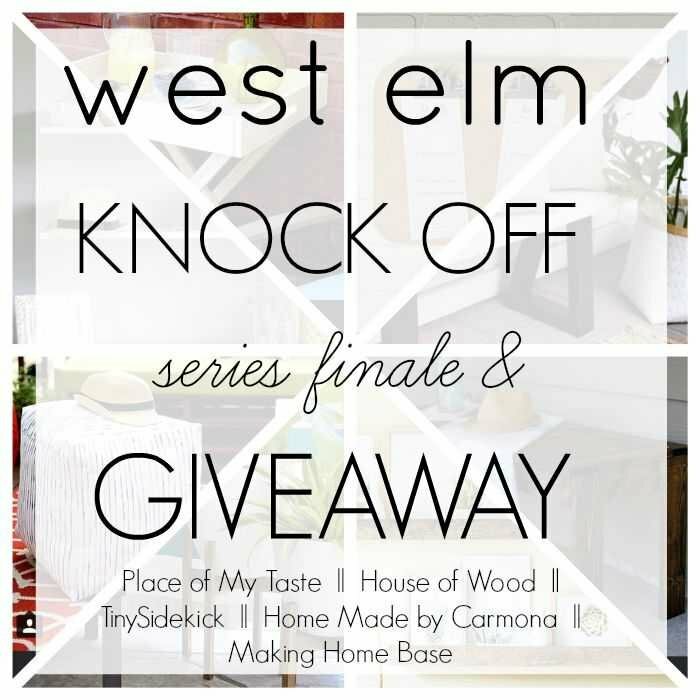 There is some serious denial going on around here because all signs point to summer coming to an end which means our West Elm Knock Off Summer Series is too, and I just don’t want to believe it! 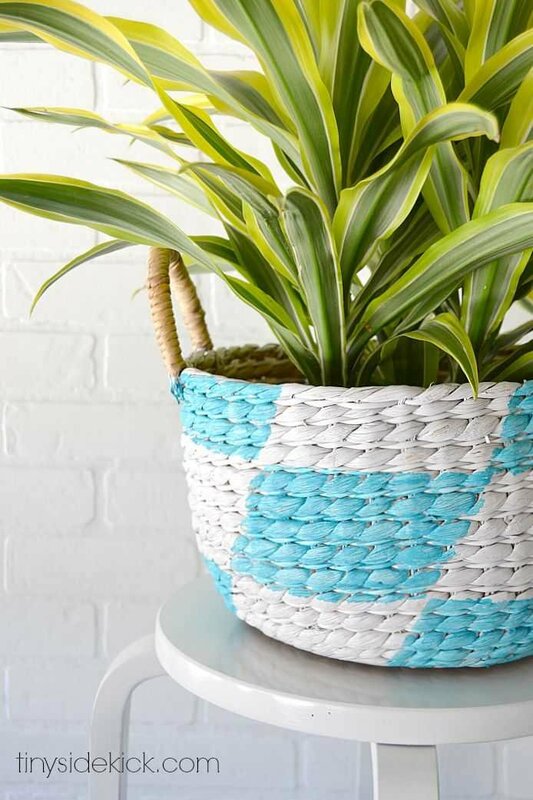 I’ve teamed up with some super talented ladies to show our West Elm knocoffs, so after I show you this really easy West Elm inspired graphic basket, be sure to browse my friends projects with the links at the bottom! This post contains some affiliate links for your convenience. Click here to read my full disclosure. One of the things I love most about knock offs is that you can take 2 things that strike your fancy and blend them together to make something that will work for you. There were 2 baskets that I loved from West Elm. I liked the shape of one, and the pattern this one, so I married the two together and created this one for about 10 bucks! A basket: I found this one at Michael’s and of course used my 40% off coupon. I also went on a day when they were having an additional 20% off your purchase, so I got an even better deal. Spray paint for the base coat. I needed white for the design I was creating. 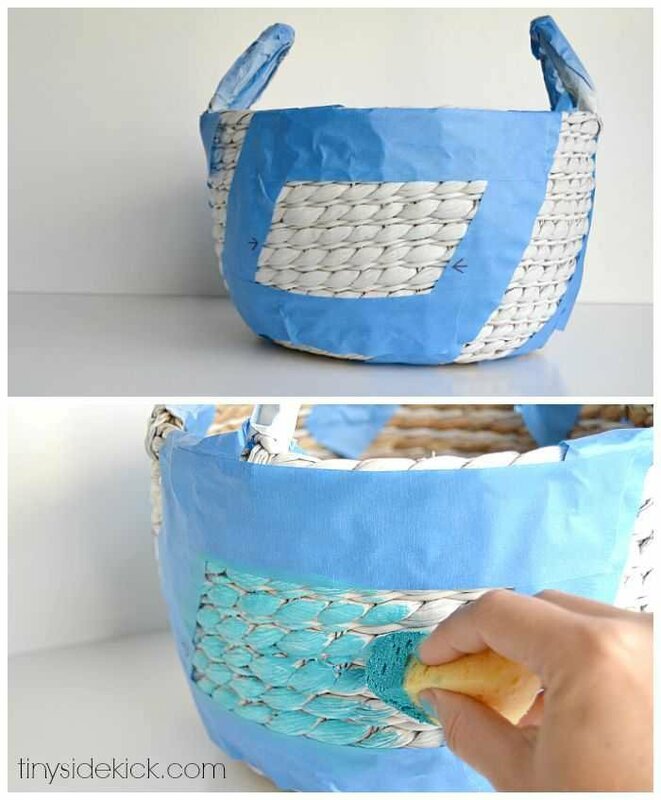 Step 1: Give your basket a light coat of white spray paint all over. I taped off the handles first because I wanted the handles to be natural on my finished basket. Step 3: Dab the paint on with a sponge making sure to never swipe toward the tape line. This will avoid getting paint under the tape. 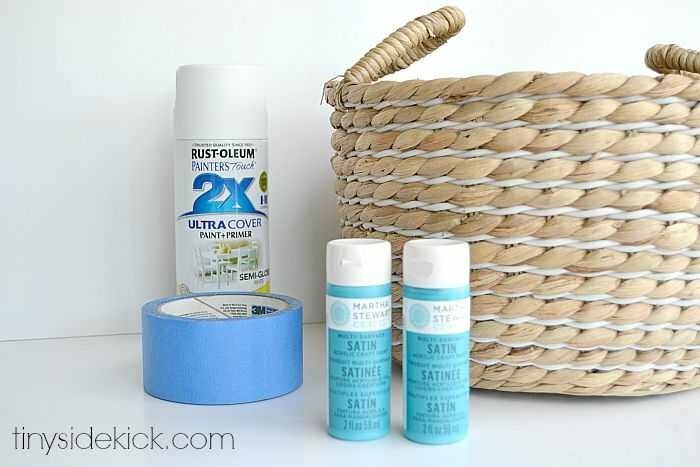 Remove the tape and let your paint dry. Step 4: Once your paint is dry, tape again so that the opposite sections will now receive the colored paint. Use the edges of the already painted area to guide where you place the tape. Apply your colored paint to these areas and remove the tape. Let it dry. And there you have it! I added a plastic tray and a colorful houseplant to my basket and I’m loving the shot of color and texture that it has added to my living room. This has been such a fun series because it has pushed me to create a few simple things to add to my home decor and I’ve had the opportunity to work with these fabulous ladies. A win-win if you ask me. 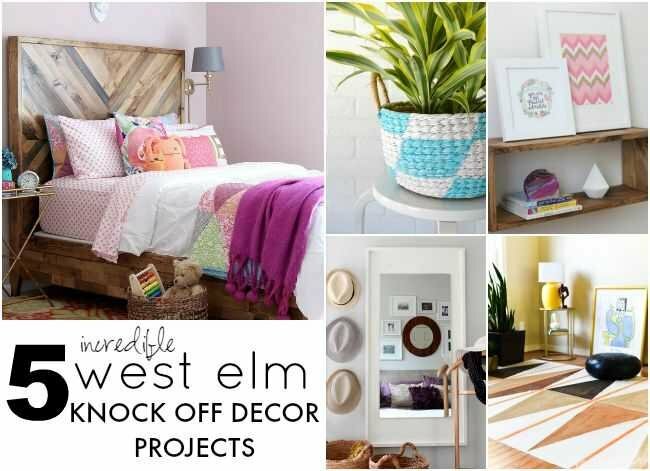 So now it’s time to go check out 4 more great West Elm knock off ideas! Thanks so much Julia! I know the feeling. I love plants so switching it up and bringing in some baskets was a must. Thanks for stopping by! proof again, little tweaks go along way! What an amazing series! Every single project is a winner. You are all amazing. Love this basket. Want to make one immediately. Also, thanks for the giveaway! Love it! 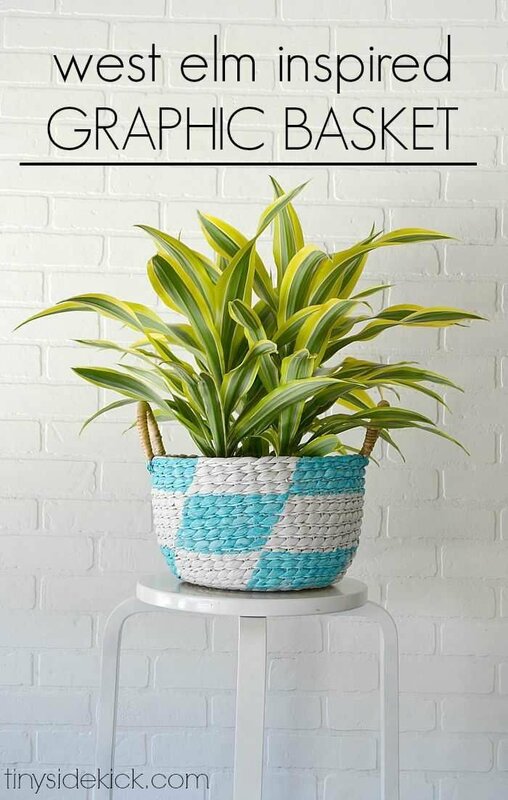 What a great way to bring style and design to an otherwise plain basket. Haha, now I want to paint all my baskets! Adorable project Corey. I’m super impressed with the quality of everyone’s projects this series – fabulous! !